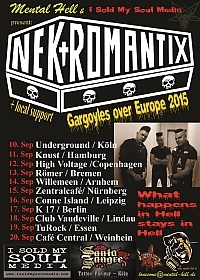 The story of the Nekromantix began back in 1989; the band was founded by Kim Nekroman, who just had left the Royal Danish Navy after having lost 8 years of his life in a submarine. After two local danish shows, the band appeared on a big festival in Hamburg, Germany, only six month after their first rehearsal session. This resulted in a record deal for the first Nekromantix album: Hellbound... By that time the psychobilly scene was mainly dominated by british bands, and world-wide psycho fans welcomed the Nekromantix new and different style. The music is best described in terms like "Elvis meets the Wolfman", add punk attitude and spice it up with a universe of monster movies lyrics. Outrageous wildness on stage and the well known coffin bass have proved that it is allowed to have fun.